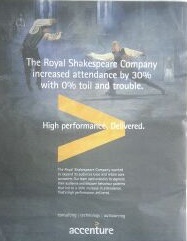 This ad for Accenture ran in the Times on 20 03 12. It should do the business. Accenture has a good record in creating strongly branded and engaging messages, promising that those that buy into its approach will be able to punch above their weight. Its past campaigns work generally on the "mine's bigger than your's" approach and pretty successful I imagine they've been too. They certainly gave a strong emotional leadership message to be part of the "success tribe"( see www.cambridgecomms.com) and surrounded the message with graphic and easy to remember logos and mnemonics eg the yellow "more than" symbol. I think this ad is an important new tack. On the face of it it's a fairly traditional "case history" ad. It's slightly glibber than previous work (punny headline) and won't be troubling any creative jury. But will Accenture care? No, your honour. This ad will be effective because of its visual story and strong rational message. It moves the Accenture capabilities message into a world that is likely to be both highly profitable to them, and an easy touch. For this is a data world, and one that has been traditionally inhabited by the geekiest of the geeks at the geeky end of the ad industry - those earnest techno-folk in thick rimmed glasses who tell you they can "mine" your data. Many of these types are incomprehensible in their analysis and often lack the power in their organisation to do anything serious about their findings upstream.Caught in an ever growing spiral of data, they tend to live in rooms where pizzas get shoved under the door to them, and blink when the door's opened. Accenture can gobble this lot up fast. Unlike the ad groups who have a history of appalling self-marketing, Accenture have been smart in building its presence, credibility,brand and relevance over time,and putting their money down where it matters. Can you imagine a WPP or an Omnicom spending marketing money on themselves in this overt way? It's just not the Ivy. Watch out ad agencies, I say: the Management Consultants stole your right to own "strategy"in the 90's; now they're out to steal your data too.